A cloud based anti-spam service is a “Software-as-a-Service” application that delivers high levels of spam and malware detection without capital outlay or high maintenance overheads. Implementation and configuration of the application is quick and easy, while the software and spam-detecting blacklists are kept up-to-date by the service provider. Being cloud based, the service is compatible with every type of operating system and universally scalable – with no limit to the number of users that can connect to it. Consequently, a cloud based anti-spam service is an ideal solution for businesses of all sizes that want to reduce the volume of spam email they receive, increase productivity, and mitigate the risk from email-borne threats. The cost of productivity loss due to spam email can be substantial. Research conducted in 2015 found that it takes on average sixteen seconds to recognize an email as spam and delete it. Typically, employees in an office environment receive twenty-one spam emails each day. Researchers calculated that an employee´s productivity loss due to spam email was 28 minutes per week – or $712.00 per year. Potentially more substantial is the cost of falling victim to a phishing email. Also in 2015, the Ponemon Institute produced the “Cost of Phishing” report – a report that revealed the average costs incurred by a business for removing infections from it network and recovering data was $1.8 million. Since the report was produced, reports of successful ransomware attacks have increased significantly. Although businesses are taking action to educate their employees about the risks posed by email-borne threats, cybercriminals methods are becoming more sophisticated. There are many more instances of social engineering and spear than there were several years ago, and it can only take one click on a “malicious URL” for a business´s network to be infiltrated or encrypted. Although all email services have some spam detection mechanisms, many are lacking in key areas. Typically they will conduct front-end tests to check blacklists for emails sent from known sources of spam, to check the email is addressed to a valid recipient, and to check that the email is from who it claims to be from (the SMPT handshake). What most email service providers fail to include in their spam-detection packages is “greylisting”. Greylisting is a process that rejects all inbound emails and request that they are sent again. Spammer´s mail servers are often too busy to respond to the request and ignore it. This helps a cloud based anti-spam service to increase spam detection rates from (typically) 97% to 99.97%. The difference in percentage may seem relatively small, but for a business whose employees receive twenty-one spam emails a day, the difference reduces the number of spam emails to one per week. In terms of the cost of productivity loss, this is reduced from $712.00 per year to $7.12 per year. In terms of the cost of recovering from a cyberattack, the savings are substantially more. SpamTitan Cloud is a versatile and easy-to-use cloud based anti-spam service from WebTitan. In addition to offering the above benefits of a cloud based anti-spam service, SpamTitan Cloud also has mechanisms in place to search for links within emails and attachments that are known to originate from unsolicited bulk email. These mechanisms block sophisticated phishing attempts and email-borne threats. Another feature of SpamTitan Cloud that is rarely present in other anti-spam solutions is outbound mail scanning. Outbound scanning prevents the scenario in which an email filter with a low acceptance threshold identifies an email originating from your business´s IP address as spam. This could be due to something as innocent as a poorly spelled email or one with too many spam-related keywords. The consequences of being blacklisted for sending spam emails can be serious for a business that relies on email for its most important communications. Until you are able to remove your business´s IP address from the blacklist, emails to your customers and suppliers will be quarantined by their email filters – potentially resulting communication delays, loss of business and loss of credibility. Proprietary spam detection technologies are usually incorporated into email service providers’ offerings, although the controls fall short of the level of protection provided by a dedicated, third-party anti-spam and anti-phishing solution. Organizations that fail to add an extra layer to their email security defenses often find their end users still have to deal with a significant quantity of spam emails and dangerous messages are not prevented from reaching end users’ inboxes. SpamTitan uses a variety of mechanisms to assess whether emails are genuine and should be delivered, or if they are spam or malicious and should be quarantined or rejected. Adoption of Office 365 is growing, although organizations that have switched to Office 365 often experience problems with spam and malicious emails, even though Microsoft has incorporated anti-spam and anti-phishing mechanisms into Office 365. To improve the security of Microsoft Office 365 to enhance protection against phishing attacks and malware, it is necessary to use a third-party spam filtering solution. By implementing SpamTitan on top of Office 365, users are better protected against new families of malware, zero-day attacks, and evolving phishing and spear phishing tactics. With all incoming emails routed through SpamTitan, organizations will see a significant reduction in unwanted emails and malicious messages in users’ mailboxes. 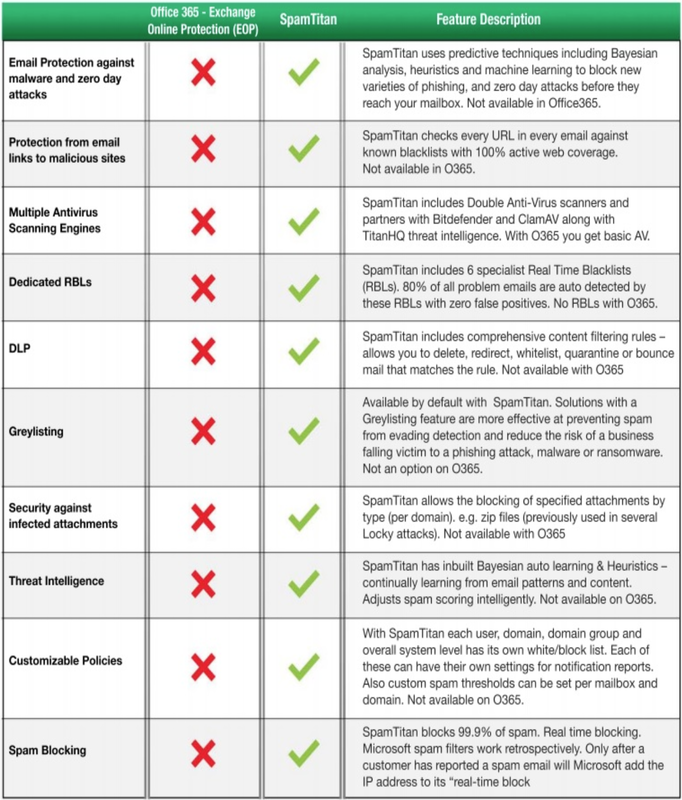 Listed below are some of the advanced anti-spam and anti-malware controls that are included in SpamTitan, which are not present in Office 365. As you may have gathered from the above, not all cloud based anti-spam services are the same. 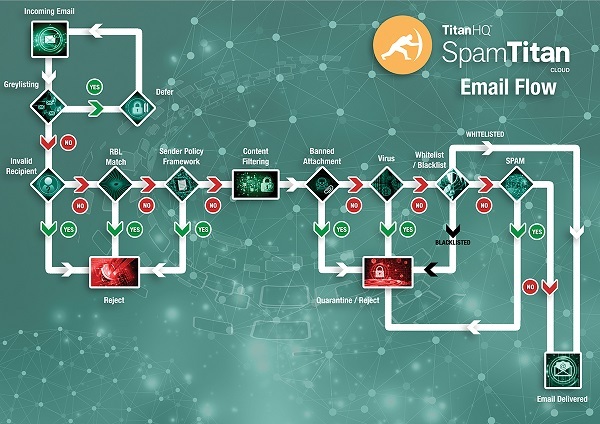 In this respect, we invite any business looking for an email filter that delivers high levels of spam and malware detection – without capital outlay or high maintenance overheads – to experience the benefits of SpamTitan Cloud for free for thirty days. Our offer includes full access to our cloud based anti-spam service, full technical and customer support, and no commitment to subscribe to our service at the end of the trial period. There are no set up costs, no credit card required and no contracts to sign. You simply register for your free trial with your email address and you will be sent details of how to adjust your MX server settings to receive the service. If you experience any problems, or if you have any questions about our cloud-based anti-spam service, do not hesitate to contact us. Our sales technicians are always on hand to provide help and advice about maximizing the effectiveness of SpamTitan Cloud, or to guide you through the web-based control panel to explain the features of our cloud based anti-spam service.